We love Trader Joe’s and not just becasuse it saves us money. This place has lots of healthy and tasty options for you to stock in your pantry. Here are some of our new favorites. Already tried some of these? Let us know what you think! I’d like to thank Callie Exas for her guest blog post. Steam Lentils: With 9 grams of protein and 8 grams of fiber (and only 120 calories) per serving, these beans are a lot of bang for your buck. Already cooked and ready to go. You can asd them to a salad, dip, or eat as part of a balanced meal. They’ll keep you full for a long time and require virtually 0 prep – just heat if you want to. Garbanzo Beans: Also known as chickpeas. These are often overlooked and underappreciated. 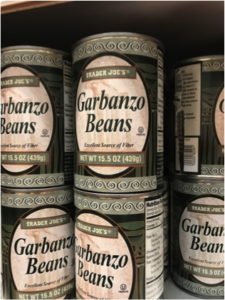 Garbanzo beans are a great way to pack in extra protein in salads, hummus, or even in a smoothie. Yes. A smoothie. Just rinse off the beans and throw them in the blender along with your other smoothie ingredients. They’ll take on the flavors and give your smoothie that extra creamy texture with or without adding dairy. 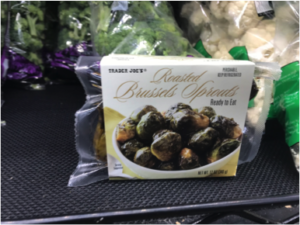 Roasted Brussel Sprouts: These are great because they’re conveniently already cooked so can be whipped up for a nice meal in a pinch. Again, lots of fiber and nutrients are packed into these cruciferous veggies so they go a long way nutritionally and keep you feeling satisfied. I love these with an egg or added to a salad. 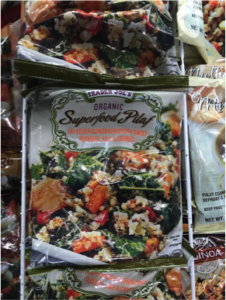 Superfood Frozen Pilaf: The frozen concoction makes for a quick and healthy main or side dish packed with vitamins from sweet potatoes, kale, and carrots. It’s made with quinoa so there’s the added bonus of a gluten free complete protein. 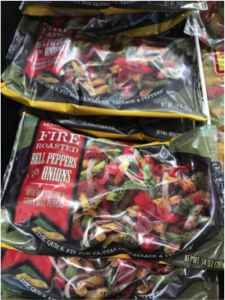 Fire Roasted Bell Peppers and Onions: These frozen veggies should be a staple in any home. Great for taco night or to add to any dish for extra kick. We love these because they’re so colorful too. Eat the rainbow! Chopped Garlic and Chopped Basil: Take the labor out of meal prep with these frozen herb cubes. Just throw them in with cooking vegetables or proteins for flavor without the sodium. 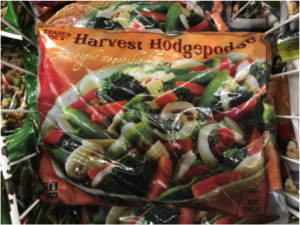 Harvest Hodgepodge: We try to eat seasonal and this veggie medley helped get us through winter while keeping our meals interesting. 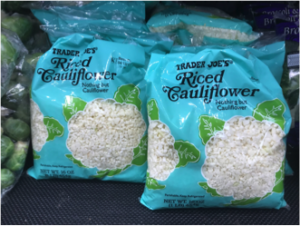 Riced cauliflower is the “it” food right now. Easy to make in the food processor but even easier to make when already riced and ready to go. Use it with any recipe that calls for rice or bake as a savory pie or dough crust for cauliflower pizza or quiche inspired recipe. Cauliflower Pizza Crust: Craving pizza but don’t want the carbs? 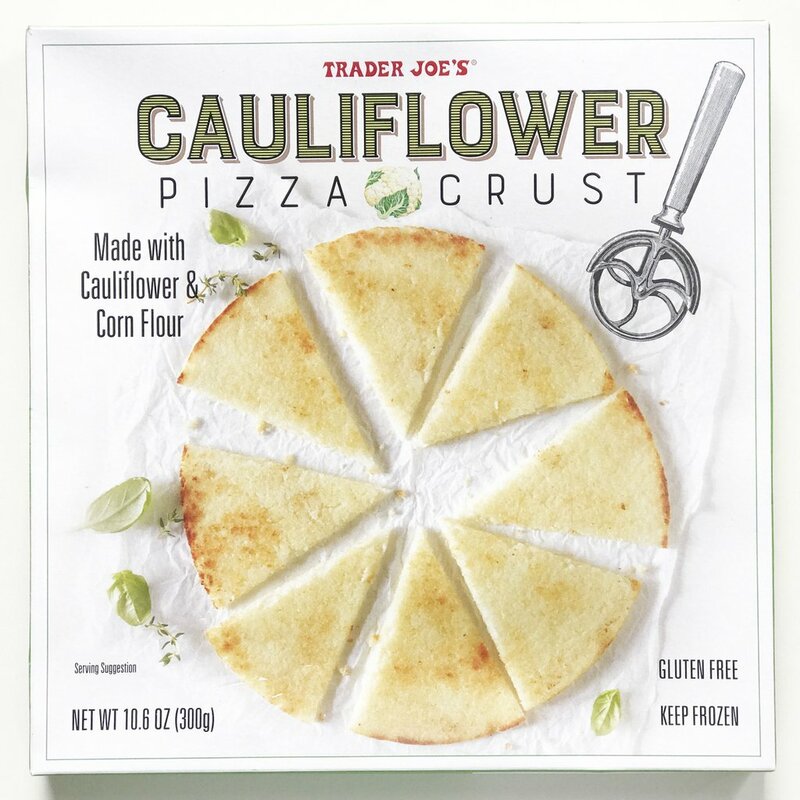 Here’s your answer – cauliflower pizza crust. It can be time consuming to make … and doesn’t always come out so good. So check out this remade pizza crust! Very Cherry Berry Blend: Did you know cherries are great antioxidants and help in recovery from workouts. 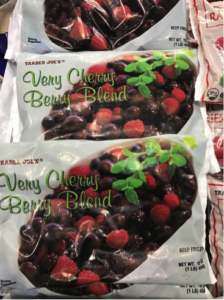 This berry blend is great for smoothies pre and post workout. 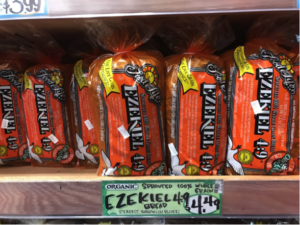 Ezekiel Bread: Ezekiel bread is made using sprouted whole grains, legumes and sometimes seeds. 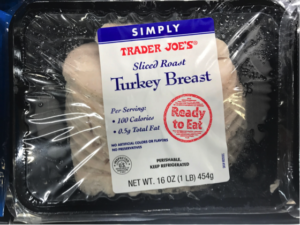 Unlike other breads, it contains no sugar, or no artificial ingredients, making it the bread with the lowest glycemic index and the highest amount of protein and fiber. If you’re trying to control your blood sugar but aren’t ready to give up bread completely, this is a great option! 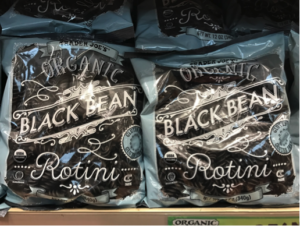 Black Bean Pasta: There are lots of new kinds of pastas on the market which is great news if you’re going gluten free. 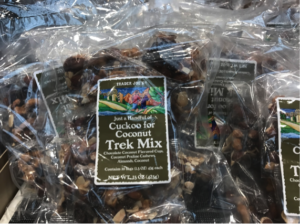 We think this one takes the cake with 12 grams of fiber and 25 grams of protein in one serving! 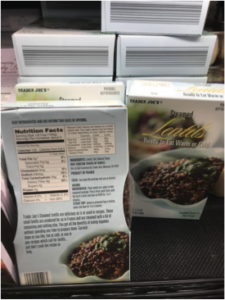 It’s also got about 36% of the RDA for iron making black bean pasta is a fabulous gluten free source of plant-based protein. 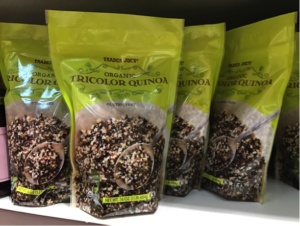 TriColor Quinoa: Quinoa is another great alternative to rice and pasta if you’re gluten free. This superfood is considered a complete protein, containing all nine of the essential amino acids. Add to veggie mixes, stuffings, even pudding (anywhere you’d use rice). We always have a box in our pantry to pull out in a pinch. 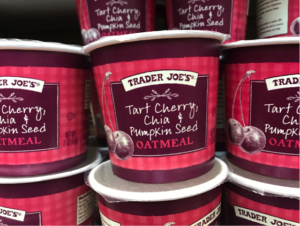 Individually Packaged Tart Cherry, Chia and Pumpkin Seed Oatmeal: Another superfood! Oatmeal is a great snack or breakfast option. High in fiber with proven data behind it showing that it helps lower cholesterol. It’s also great for new breastfeeding moms because it helps with milk production. These version is low in sugar, but still a bit sweet with cherries. The chia and pumpkin seeds have added benefits with extra protein and vitamins, and omega 3 fatty acids. 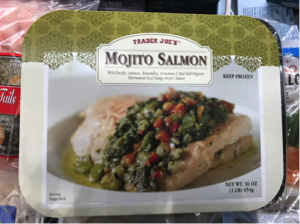 Mojito Salmon: We love salmon and Trader Joe’s frozen wild caught Mojito Salmon is a great option for anyone who doesn’t feel like scrapey a meal together after a long day. Salmon is rich in omega 3s, b vitamins. The mojito salsa adds a fresh and flavorful kick. protein addition for salads, sandwiches, etc. 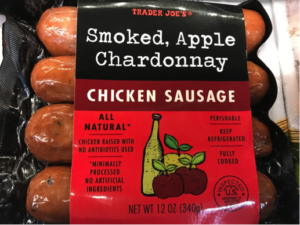 Smoked Apple, Chardonnay Chicken Sausage: Chicken sausage is always an easy answer for livening up pasta, rice, or veggie dishes. It’s already cooked so you can just heat it up and go! Nutritional Yeast: If you’re trying to cut out dairy from your diet but LOVE cheese, try this alternative. 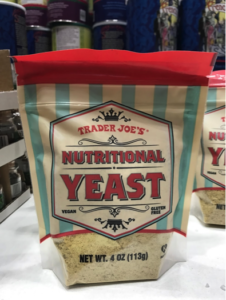 Nutritional yeast can be sprinkled onto anything where you’d want a delicious cheesy flavor (think Parmasan), plus it’s a complete protein with lots of minerals. 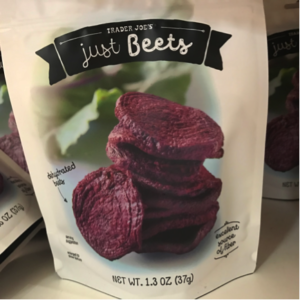 Just Beets Chips: Beets seem to be making a comeback in many forms. You can find it in pastas and now chips! This snack has no preservatives or additives. They are literally just dehydrated beet slices that pair great with the Spinach and Kale Greek Yogurt Dip. and you’ll never be “hangry” again. 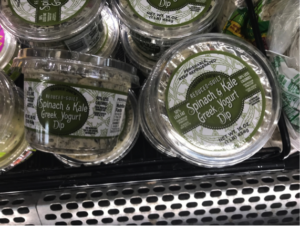 Reduced Guilt Spinach and Kale Greek Yogurt Dip: This is a great little snack item for very few calories. It tastes rich, creamy and tangy. Great with crackers or veggie sticks. The greek yogurt offers a bit of protein; 1 gram per 2 tablespoons any few carbs. 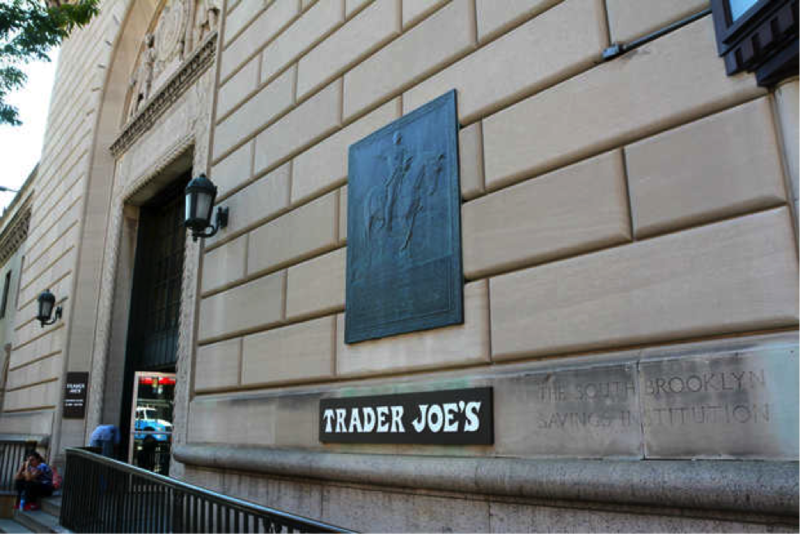 What are some of your favorite products at Trader Joe’s? I’d like to thank Callie Exas for her great blog post! 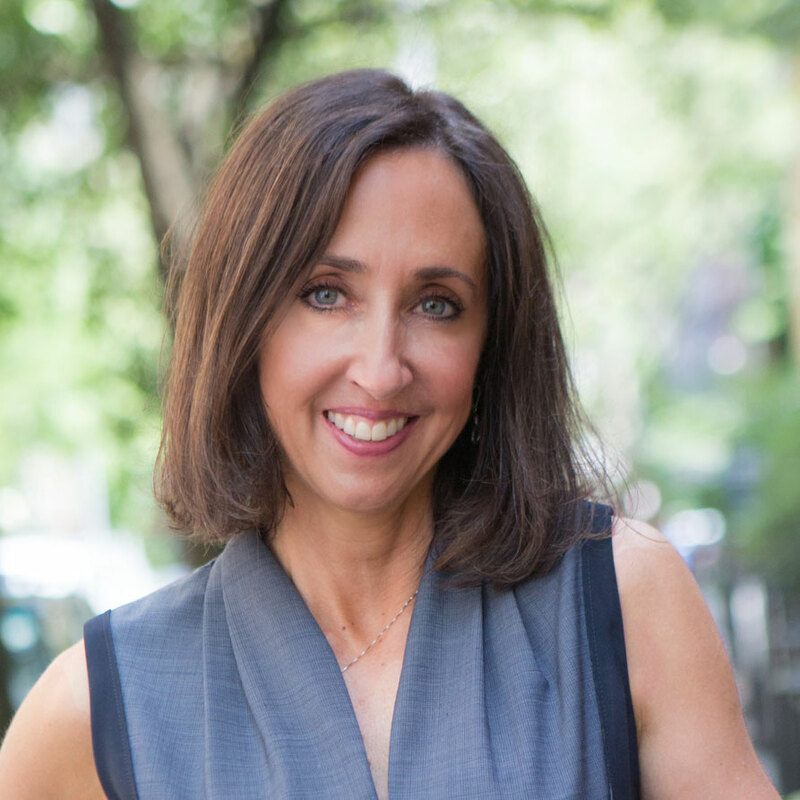 Callie Exas holds a BS in Communications from Temple University, an MS in Clinical Nutrition from Brooklyn College, and an MPH in Community Nutrition from NYU. She recently completed her Dietetic Internship through Brooklyn College and is on her way to becoming a licensed RD. 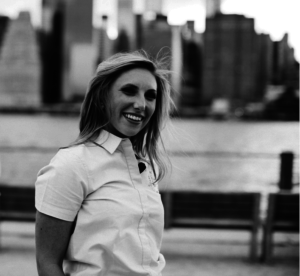 Callie has worked in the health and fitness industry for almost 10 years sharing her knowledge and passion for wellness as a trainer and health educator for adults, children and businesses throughout NYC. She lives in Brooklyn with her husband, Tim, and dog, Finley and makes sure they both eat their veggies.